St. Callistus, Pope, Martyr - My Catholic Life! Popes owned slaves for centuries to row their boats, cook their meals and care for their horses and carriages. Kings, nobles, and middle class families owned slaves. It was a ubiquitous institution not necessarily rooted in racism, which was a latecomer as a rationale for enslavement. Rather, prisoners of war and criminals of every skin color were enslaved as alternatives to capital punishment. Others were born into slavery from slave mothers, and still others sold themselves into slavery in exchange for food, shelter, and security. Today’s saint, according to ancient sources, served as a slave in a Roman home for many years, and thus was part of that massive social reality of slavery that not even Saint Paul explicitly condemned in his letter to Philemon. Since he was an intelligent and resourceful servant, Callistus’ master put him in charge of his personal bank. But when Callistus lost its deposits, he was blamed and was eventually exiled to the mines of Sardinia. At some point he was released from this hard labor and earned freedom from his slave status. 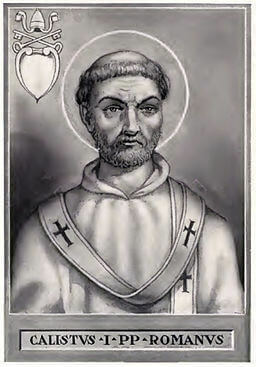 Pope Zephyrinus, elected in 199, placed the capable Callistus in charge of the most important underground Christian cemetery in Rome. Under Callistus it eventually grew into a sprawling, thirteen mile warren of dark, narrow tunnels lined with tombs chiseled out of the soft tufa stone. 500,000 bodies were encased in its walls! Callistus was so successful in managing the cemetery that it came to bear his name, and bears it still—the Catacombs of Saint Callistus. Besides numerous martyrs, it also houses a famous chapel for nine third-century popes. The Catacombs were ground zero for early Christian devotion in Rome. They were not hiding places from persecution but sacred ground on which to kneel beside a martyr’s lifeless body. Saint Jerome himself writes about his regular visits to pray at the martyrs’ tombs in the catacombs a century and a half after Callistus expanded them. There were no Viking funerals, Hindu pyres, or urns on the mantle for these early Christians. They believed in the resurrection of the body, as the Church still does. They knew, instinctively, that it was more fitting to bury a body, to keep watch with the dead, than to casually dispose of a body or to bake it like a pie. The same Pope Zephyrinus ordained Callistus a deacon. Deacons have a tighter bond, theologically, with bishops than with priests. Since the Acts of the Apostles, they were ordained specifically to assist the first bishops, the Apostles. The first three centuries of the Church resound with the names of deacons, such as Saints Lawrence and Vincent, who were martyred alongside the popes and bishops they served. Pope Saint Sixtus II was killed, in fact, along with his coterie of deacons after they were all arrested in the Catacombs of Callistus in 258. In approximately 217, the deacon Callistus was elected the Bishop of Rome, crowning his long and arduous path from slavery to a more exalted form of service to the Divine Master. Pope Callistus encountered resistance over the perennial third century theological-pastoral issue of how to reintegrate Catholics who had been forced to engage in emperor worship. Callistus held that if God could forgive murder and adultery he could forgive idolatry too. No sin was unforgivable. His bitter enemies, including the first antipope, Hippolytus, considered Callistus too lax, and committed their calumnies to writing. This damaged Callistus’ reputation into modern times, when scholarship finally called into question the veracity of his enemies’ accounts. Saint Callistus’ life is not richly detailed, but he died in 222, most likely by martyrdom and, ironically, was not buried in his eponymous Catacomb. His tomb was rediscovered in 1960. His remains were transferred in the ninth century to Rome’s church of Santa Maria in Trastevere, which tradition holds was built over, or next to, an earlier church of which Callistus was the patron. Saint Callistus, you served an earthly master as a slave and a heavenly master as a deacon and pope. You made Christian burial and praying for the dead a defining feature of the Church of Rome. May we honor you in death just as you honored so well your own forebearers in the faith. EARLY in the third century, Callistus, then a deacon, was intrusted by Pope St. Zephyrinus with the rule of the clergy, and set by him over the cemeteries of the Christians at Rome; and, at the death of Zephyrinus, Callistus,according to the Roman usage, succeeded to the Apostolic See. A decree is ascribed to him appointing the four fasts of the Ember seasons, but his name is best known in connection with the old cemetery on the Appian Way, which was enlarged and adorned by him, and is called to this day the Catacomb of St. Callistus. During the persecution under the Emperor Severus, St. Callistus was driven to take shelter in the poor and populous quarters of the city; yet, in spite of these troubles, and of the care of the Church, he made diligent search for the body of Calipodius, one of his clergy who had suffered martyrdom shortly before, by being cast into the Tiber. When he found it he was full of joy, and buried it, with hymns of praise. Callistus was martyred October 14, 223. Reflection.— In the body of a Christian we see that which has been the temple of the Holy Ghost, which even now is precious in the eyes of God, Who will watch over it, and one day raise it up in glory to shine forever in His kingdom. Let our actions bear witness to our belief in these truths.